ST. PETERSBURG, Florida (Sunday, March 11, 2018) – If the first race is an indication, the Verizon IndyCar Series is in for a wild, unpredictable and most exciting 2018 season. Sebastien Bourdais repeated as winner of the Firestone Grand Prix of St. Petersburg today, but only after rookie Robert Wickens and Alexander Rossi collided while battling for the lead on the next-to-last of 110 edge-of-your-seat laps. It was the first of 17 Verizon IndyCar Series races this season. For Bourdais, the spoils of being in the right place at the right time were the 37th victory of his Indy car career, which ranks the four-time season champion sixth on the all-time list. The driver of the No. 18 Team Sealmaster Honda for Dale Coyne Racing with Vasser-Sullivan trails Al Unser by two wins for fifth place. It also brings full circle Bourdais’ recovery from a fractured pelvis and hip sustained in a frightening crash during qualifying at last year’s Indianapolis 500. “This is emotional because I was able from a few broken bones to come back in this victory circle,” said Bourdais, who lives in St. Petersburg near where the 1.8-mile temporary street course is constructed each year. Wickens, who started from the pole position in the No. 6 Lucas Oil Schmidt Peterson Motorsports Honda after winning the Verizon P1 Award in qualifying on Saturday, was vying to become the first driver to win an Indy car race in his debut since Buzz Calkins in 1996 at Walt Disney World Speedway. After leading a race-high 69 laps, Wickens was in front for a Lap 108 restart following a full-course caution for the stalled car of Max Chilton. On the restart, Rossi, in the No. 27 NAPA AUTO PARTS Honda for Andretti Autosport, attempted an inside pass of Wickens heading into Turn 1 at the end of the Albert Whitted Airport runway straight, but Rossi’s car slid wide and the two made contact. Rossi continued but Wickens’ car was disabled, bringing out the last of eight full-course cautions in the race. “I didn’t get the best restart in the world, but that didn’t really matter,” said Wickens, who was scored in 16th place. “I (braked) really late into Turn 1. I defended a little bit, but the track was so dirty off-line that I told myself that if Alex wants to go there, go for it, but he’s not going to make the corner. He made a mistake on the inside and I guess he just couldn’t keep it, and just slid into me. Bourdais and Graham Rahal, running behind Wickens and Rossi, avoided the incident and slipped past to finish first and second, respectively. Bourdais’ victory is the sixth in the history Dale Coyne Racing and the fifth for Bourdais in cars entered by co-owners Jimmy Vasser and James Sullivan. Team co-owner Dale Coyne admitted it wasn’t the best car on track, but benefited from having Bourdais in the cockpit and a little good fortune after he had to pit on the opening lap to replace a punctured tire. Rossi, who finished third, said he got the jump on Wickens for the decisive restart by activating earlier his push-to-pass – which provides an engine boost of approximately 60 horsepower. “The run was perfect for me going into Turn 1 and I knew there wasn’t going to be very many other opportunities,” Rossi explained. “Obviously, he had a good car all day and they did a great job. Made the (pass attempt). He defended the position, which he has the right to do, but in doing so, in moving the reaction, he put me into the marbles pretty late into the corner. Rahal, driver of the No. 15 United Rentals Honda for Rahal Letterman Lanigan Racing, logged his best St. Petersburg finish since becoming the youngest race winner in Indy car history in 2008. James Hinchcliffe, Wickens’ teammate at Schmidt Peterson Motorsports, finished 4th in the No. 5 Arrow Electronics SPM Honda. Ryan Hunter-Reay, Rossi’s teammate at Andretti Autosport, placed 5th in the No. 28 DHL Honda. Three-time St. Petersburg winner Helio Castroneves, this year’s grand marshal, gave the call for drivers to start their engines in what quickly became an eventful race on the shores of Tampa Bay. 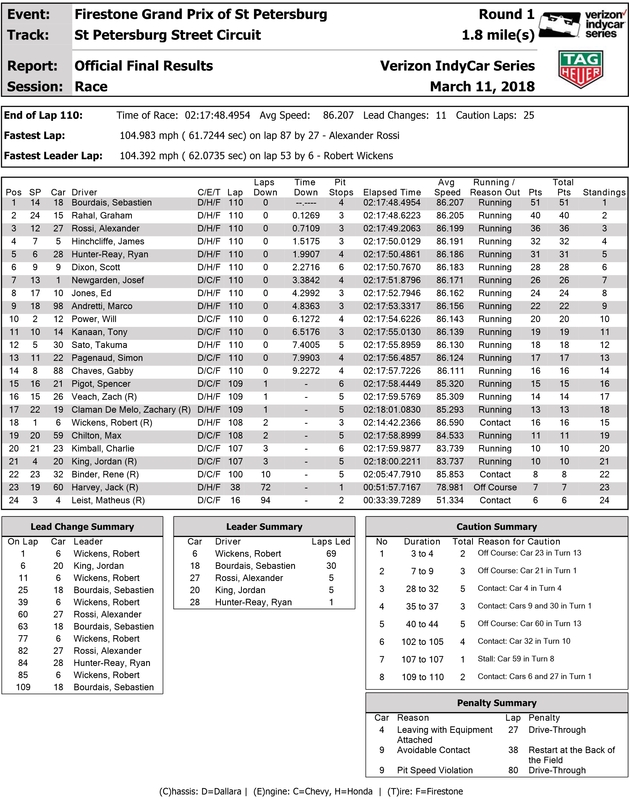 There were five caution periods in the first 40 laps of the race as drivers adjusted to the lower downforce levels of the universal aero kit on all cars racing for the first time. Still, the new car produced incredible racing throughout the field, as there were a record 366 on-track passes to break the old race record of 323 set in 2008. Verizon IndyCar Series competitors and fans have some time to catch their breath before the next race. The Phoenix Grand Prix will be run under the lights at ISM Raceway on Saturday, April 7. The race airs live at 9 p.m. ET on NBCSN and the Advance Auto Parts INDYCAR Radio Network.